This weekend only! £10 OFF Disklok & Free Delivery! Replacement Seats - seats supplied with most new cars are a compromise. They need to fit everyone and therefore fit no one properly. At Carnoisseur you can choose from a massive range of sports seats specially designed to fit you and your car. Fixed Back Seats... Bucket type seats are ideal for fast road use. Carnoisseur can offer a tailored baseframe or side mounts where suitable, ensuring your seat is fitted securely. Reclining Seats... These are more adaptable and allow fine-tuning of the backrest. They also enable the seat to tilt if access to the rear is required in a 2-door car. Ultra luxurious with plenty of custom options; leather upholstery, embroidery, lumbar support, carbon backrests, etc. Competition Seats... We supply a huge range of FIA approved seats suitable for all types of motorsport. Check to see if you need them to be FIA approved for the events you are participating in. Often these seats will need to be bolted, via side-mounts directly to your vehicle. Whatever your requirements Carnoisseur will be able to help and advise the best way to proceed. A suitable harness can be supplied at the same time in your choice of colour and configuration. Specialist Seats... Special seats for special cars. Kit Cars, Minis, Lotus 7, Beetles, Campers etc. Tell us what you have and we will help. Once you have selected the seat of your choice it is then time to choose the fabrics and colours...Fabric, Cloth, Vinyl, Leather. The choice is yours. Let us quote you for the different types. Colours... A massive colour range is available. Trimming... If door cards and rear seats require trimming then this can be arranged by Carnoisseur. A local trimmer is used or, in some cases, the manufacturer of the seats are able to offer this facility. Carnoisseur can even supply you with a roll of matching material. Interior Accessories - Steering Wheels, Gear Knobs, Gaiters, Tax Disc Holders, Tailored Mats, Replacement Dials, Gauges... a comprehensive range of the latest branded accessories designed to make your car a nicer place to be! 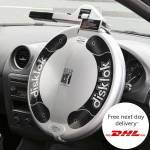 Carnoisseur have a full range of Disklok Steering Wheel Locks. To view the Disklok Steering Wheel Locks we offer simply make your selection below. You can purchase Disklok Steering Wheel Locks on-line or through our network of Carnoisseur Outlets. To find out more about Interior click here to view our Carnoisseur Interior Guide.